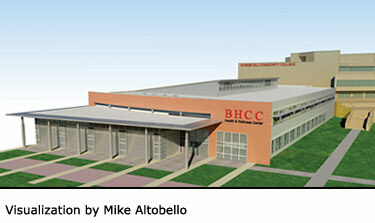 Bunker Hill Community College in Boston, Massachusetts will build a 48,000-square-foot health and wellness center with state-of-the-art classrooms and laboratories, which will support its nursing and other health-related programs. The health and wellness center will be the first new building on the Charlestown campus in 30 years. The project costs are $22.7 million, with $450,000 donated by the community college’s students via the student government association. Two legislators, retired Senator Jarrett T. Barrios and State Representative Eugene L. O’Flaherty, got on board to shepard the project through the legislative process. The building is expected to meet the requirements of the Leadership in Energy and Environmental Design (LEED) Green Building Rating System™. LEED is a third-party certification program for the design, construction and operation of high performance green buildings. The Bunker Hill Community College structure will be engineered to reduce energy requirements for heating and cooling, conserve water and to maximize the use of natural light. With nearly 9,000 students, Bunker Hill Community College is the largest community college in Massachusetts. The demographics of its college show that six out of 10 students are people of color and more than half are women. International students make up 640 of its student population, coming from 103 countries.